Welcome to the holiday weekend. For many, it’s a time for sales and sand, barbecues and beaches. For me, it’s a time of marathon gardening. I still have so many plants that have to get into the ground — and I’m never quite sure how I end up in this position each year. I try to pace myself, but inevitably, I fall behind. So, here is my whirlwind. 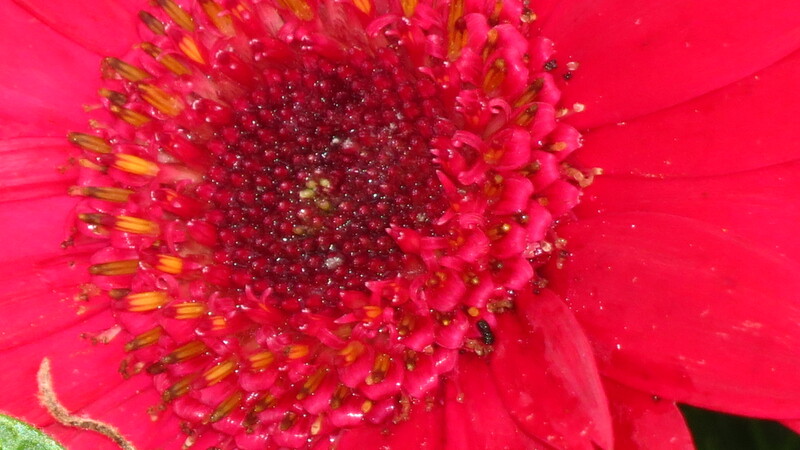 First, there is the issue of the May curse — better known as Oak pollen. It assaults me as soon as I step outside. 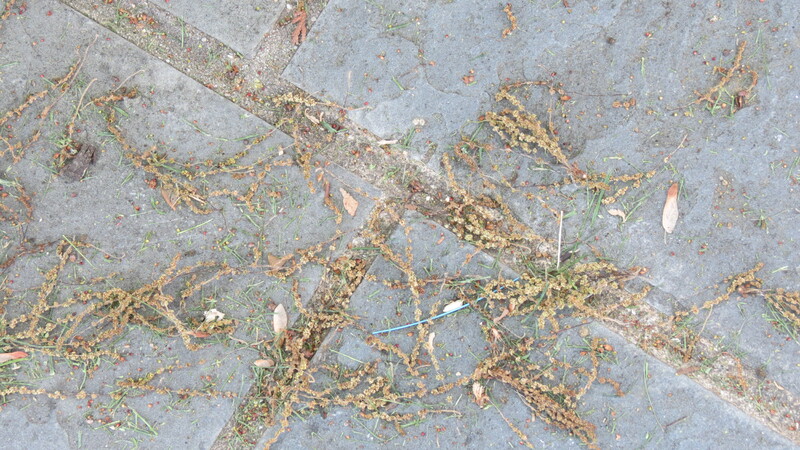 When the wind blows, it looks like it’s raining worms — and when enough of it gathers on the ground, it looks like tumbleweeds. Actually, I’m okay with pollen when it’s on the ground. It’s when it’s in the air, in my throat, and in my eyes that I have an issue that requires a tissue. Ahhhhchooooo! 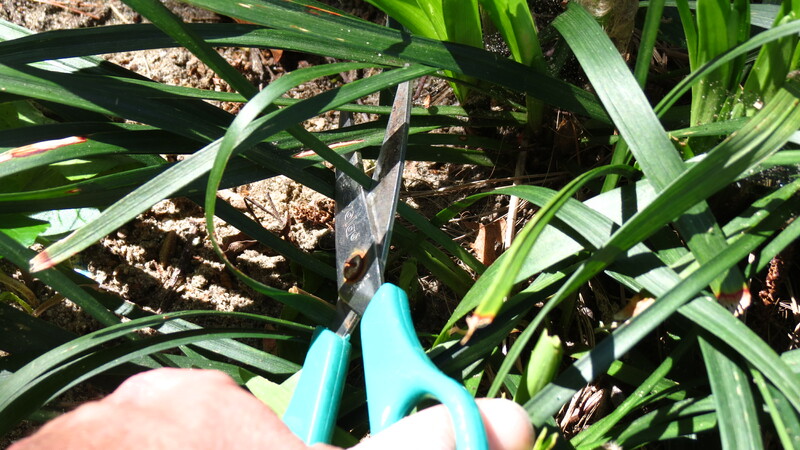 Then the Liriope needs a haircut. 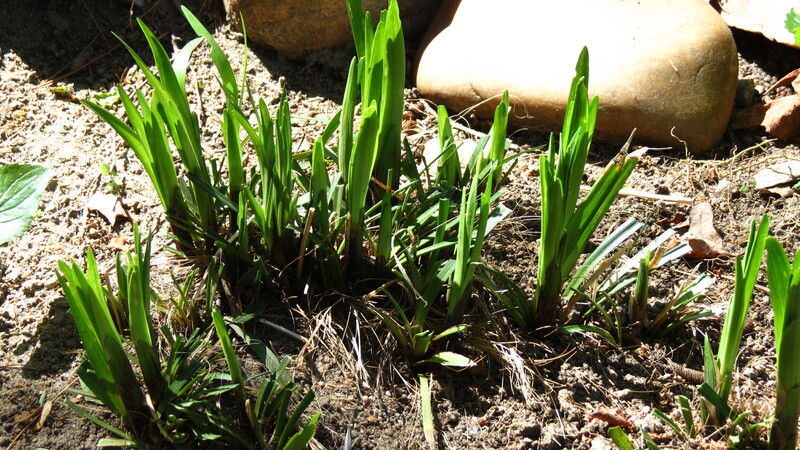 Last year’s growth is a little worn from the winter, but emerging in the nest are fresh green spears. With my grandmother’s scissors, which are small enough to maneuver so I don’t cut the new growth, I snip a little here and snip a little there. Time to plant the Dahlias. If you have Dahlias that will grow tall enough to require staking, here’s a quick tip. 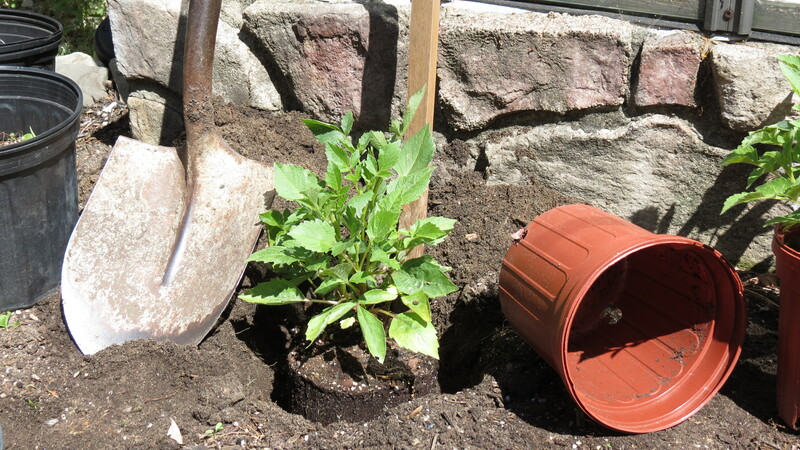 Plant the stake at the same time that you plant the Dahlia. This will prevent any accidental spearing of the Dahlia tuber if you place the stake later on in the season. Joe calls me to the front yard. 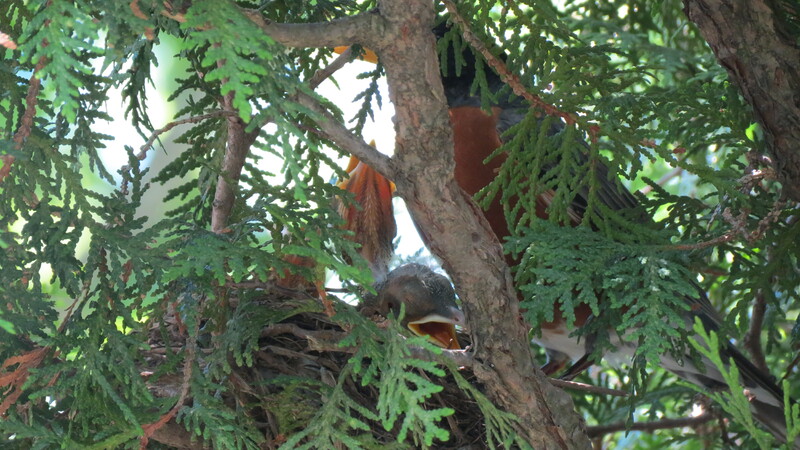 We have a robin’s nest in the tree, and there is a clear view of the three hatchlings. So I pulled out a ladder, climbed up, and snapped a few photos — all the while staying alert for any adult robins that might attack me. I’m a little jumpy when it comes to birds since my head has been targeted three times. But the baby robins are cute, and we are both hoping that they survive. At last, it’s time to take a look at the reds . . .
the whites . . .
and the blues . . .
and to remember that this holiday isn’t about sales and sand, barbecues and beaches, nor plantings and pollen. ← Terracotta Love: Now That’s Amore! I like your tip to as add stake when planting bulbs. I wish I had thought of stakes earlier. I stabbed a bulb already this week. Ouch! I learned this lesson the hard way, and it has saved me numerous times. There’s always next year. Thanks for commenting. 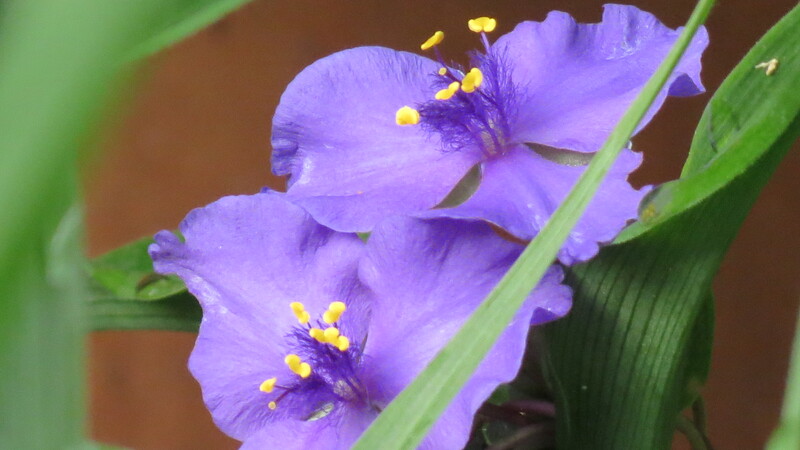 Kevin, Enjoying your blog….will pass along to friends & family here in NC. Patsy, so glad you’re enjoying the content here. And thanks for passing it on. Happy Memorial Day. I really like the way to propagate Hydrangia’s. I am just getting started with growing them and finally am having luck doing it. Loved your Memorial post. Hello and welcome. Glad to hear that you’re having success with hydrangeas. 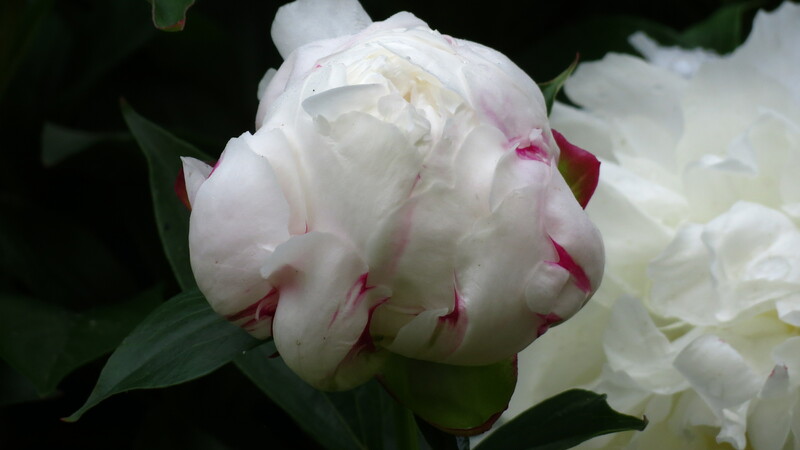 They’re a beautiful shrub — and reliable. Thanks for commenting. Hope to hear from you again. a great catch up in the garden, we never have enough time do we? But somehow jobs get done, or postponed with a shrug. 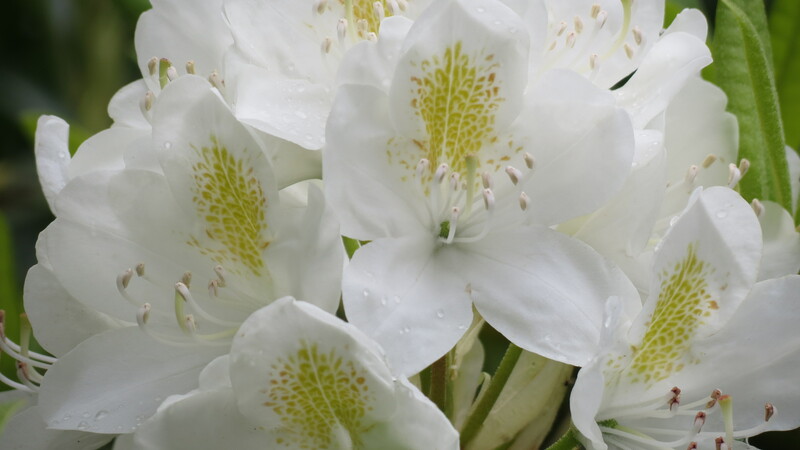 I think my favourite photo (apart from the Robins) was of the white Rhodendron., I don’t think I’ve seen one so delicate looking. Well ok, thinking about it a bit more the pool shot was outrageously tempting too. Until this year (with blogging) I hadn’t been aware of memorial day, so I keep on learning! 🙂 Apparently, Memorial Day is an American holiday to remember those who have made the ultimate sacrifice for their country. Somewhere along the way, sales and barbecues took the lead. 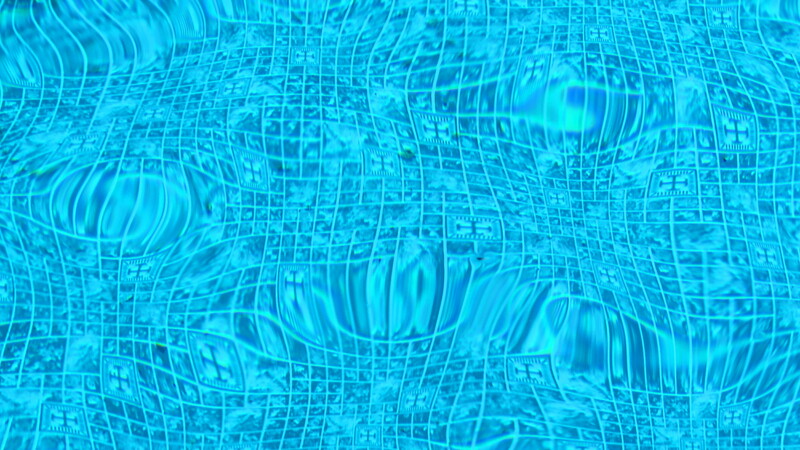 It’s the unofficial start of the summer season — and that pool photo looks a lot warmer than the actual water temperature. Still a bit chilly for me. Thanks for commenting! Yes, there is a pool — although the water is a bit too cool for me. I think Memorial Day is an American thing — but the true meaning has gotten lost in the barbecues and sales. For many, it’s a day off from work. The robins are sweet! We had a brood in our garden shed last year – they found a hole and built a nest in the rafters – safe from the neighborhood cats! Hi Ann. Each day, we check on the nest. The craftsmanship is amazing, and it’s been fascinating watching the mother get food and feed the young ones. Even more fascinating is what happens when a predator gets too close. Thanks for commenting. Beautiful Photos! Nature’s deadlines…I think we’re all a bit stressed this time of year. Good luck, and thanks for another great post. That last shot is a good reminder of Memorial day. I hope you get all caught up in the garden. Now, THAT would be an amazing post as I doubt very many of us ever get completely caught up! 🙂 Glad you took out time to look at the birds, the reds, the whites, and the blues. 🙂 I agree with you — I’ll never be caught up. There’s always something to do. The problem is always time. Happy Memorial Day! makes me feel a little better that I am not the only one that feels like they r running behind. And thanks for the reminder of what this Holiday is about. Makes me just a little sad that people dont know the real reason for it. Will be outside most of the day in my gardens too weeds grrr.. but I also will take time out to be in my memorial garden thinkin of those who r no longer here and thanking those who r defending our freedoms!!! I have a feeling that you and I are not the only ones who are feeling the pressure that we’re falling behind. Like another commenter said, there’s always work to be done in the garden. It’s just an illusion to think that we’re ever finished. Thanks for commenting, and Happy Memorial Day. Red is one of my favorite colors for the garden. Nice to hear from you. Hope all is well. Memorial Day is meant to honor members of the armed services, but that meaning can get lost. But once all of the parades are over, it’s back to the garden. Enjoy your long weekend! Beautiful! Happy gardening to you. Char, glad you liked it. Hope you had a memorable weekend. Yes, I had a blast all weekend with lots of company. But no gardening got done because of that. That’s all right though. It was worth it. Just a little history for some of your readers – Memorial Day was originally called Decoration Day – members of the veteran’s associations would go to the National Cemeteries and place a flag at the headstone of every fallen soldier, sailor, marine. My mom always referred to it as Decoration Day, so it was probably changed to Memorial Day sometime in the 1940’s or ’50’s. It’s a day to observe, rather than celebrate, although that’s been forgotten by most Americans. 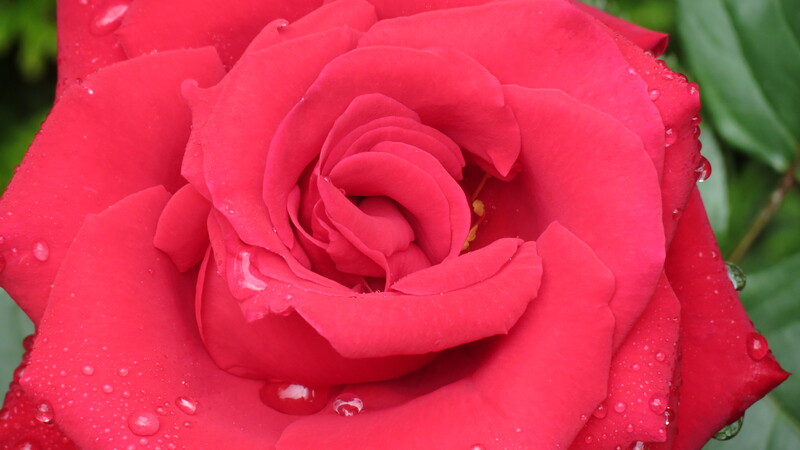 Loved the photos – the rose took my breath away – it is gorgeous!!! Was the photo of the flags at the entrance to Calverton? Although you feel you’ll never get the time to do everything, just a few weeks more and you’re have the entire summer to dig, weed and reap the fruits of your labor! Keep your eyes on the prize! Take care! Hi Aunt Pat. Thanks for the history lesson. It is sad that the true meaning seems to have gotten lost, although why should Memorial Day be any different from so many other holidays? But that’s a rant for another post. 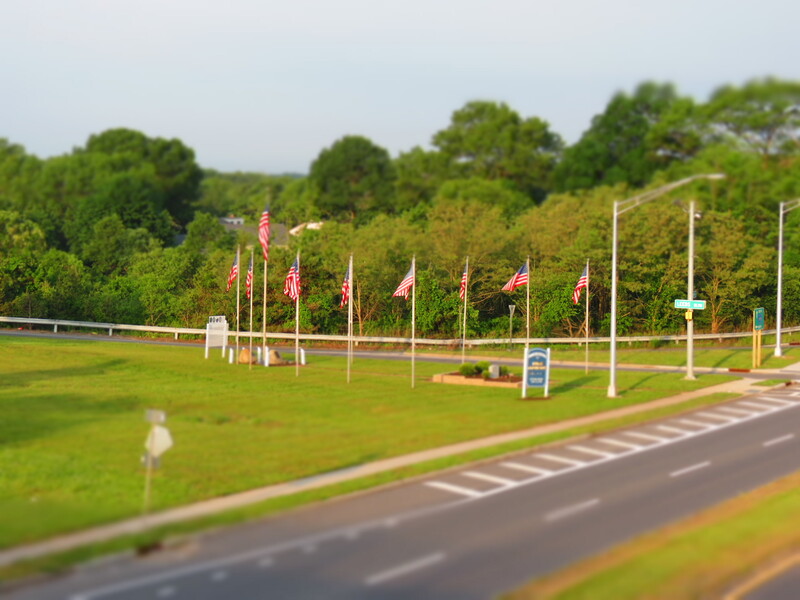 The flags are actually near an interchange. They’re part of a small veterans’ memorial park. Kevin, I had a marathon gardening weekend, too — much more satisfying than any barbecue or parade. There’s still lots more to do, but at least I feel as though I’ve made a good start. I love your reds.